Thomas Wessel presents how T-shaped and pi-shaped teams based on each member's span of knowledge, ability to collaborate, and depth of expertise play an important part in how effectively your team performs. The software development field has been consumed with process management ranging from inflexible, predictive waterfall all the way to self-governing, adaptable agile approaches. You probably already utilize a specific process methodology on your projects, but have you considered adopting an evolutionary learning cycle process framework instead? 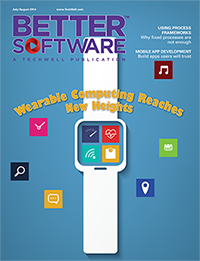 With mobile and small embedded devices extending the reach of modern computing, the predictions are that wearable computing is definitely the next biggest thing. If you want to know more about the wearable device revolution, Mukesh presents facts that will convince you this is the next hottest trend.